Heat a cast iron or stainless steel pan over high heat until hot. Sear steak for 2-4 minutes per side or until desired doneness. When steak is nearing finish, add sliced mushrooms. Once steak is ready, take it out of the pan and let it rest while completing pan sauce. Add 1 Tbsp. of butter to mushrooms in skillet and scrape up residual steak, or fond, left in bottom of pan. Add shallot and salt, and sauté until mushrooms are browned. Slowly add half of wine and deglaze the pan by scraping up any remaining fond. Be careful as alcohol can cause a flame to rise. Add remaining wine and beef stock, and let the sauce reduce for 10-15 minutes, until syrupy in consistency. Add the remaining butter, turn off heat and stir to incorporate. Do not overheat the sauce at this point or the sauce will break. Add the thyme and spoon sauce over rested steak. 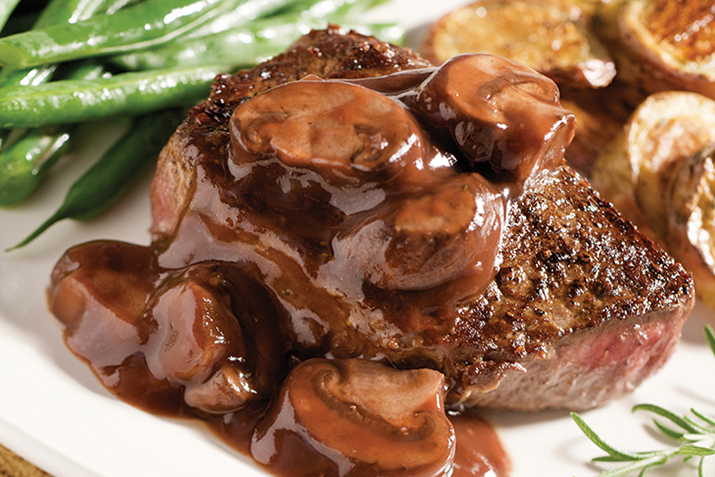 Red wine pan sauces complement any red meat. Heartier meats such as roasts are complemented by pan sauces using Cabernet, Merlot or Zinfandel. Avoid using wine that has been aged with oak. Serve pan sauces immediately and discard unused portion. Learn how to make delicious pan sauces and watch Johnny Livesay make this recipe in this Co+op Kitchen video.